No need to turn the sound up for this clip from The View yesterday - it speaks volumes even at low decibels. They were talking about Epicurus, the Greek philosopher (341 - 270 BCE) who advocated living a tempered life rather than an overly-indulgent one, as might befit post-modern epicure sensibilities. And so one thing led to another and next thing you know, they're chatting about religious chickens and eggs, relative to the Hellenistic era, which is BCE or BC, if you happen to be from Prince George and/or measure time Christologically. 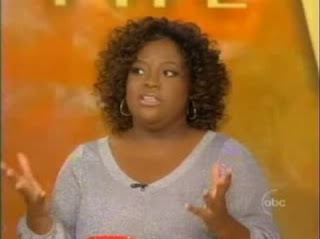 Sherri Shepherd's responses ~ "Jesus came first" and "I don't think anything predated Christians" ~ are not only pop-culture classics and fabulous fodder for bloggers, they're also revealing statements about her not-so-unique brand of religiosity. Now I don't mean to poke fun at her....that's Whoopi's job. Nor can I accuse her of being born yesterday, especially when I know she was born again. There's a marginal difference. I get the narrow albeit brightly lit tunnel she's standing in. I can even picture it grafitti'd with slogans like "Ignorranse is blisse!" and "Tribulation Tunnel: Next Stop - Heaven" and "Jesus Loves Me, this I Know, for the Bible Tells me So." In her mind, Jesus transcends time and history as we know it, Genesis is literal and the earth, she is young. And in her rather flat worldView, chronological religious history is irrelevant. I mean gosh golly, the world wasn't even created until a handful of millennia ago. Greco-Roman religion and mystery cults? It's all Greek to her. Judaism? A nishtikeit religion that pales in comparison and more to the point, doesn't even warrant mention. And forget the Shahadah (the Islamic creed) and the Mohammed the messenger stuff. The Lord Jesus is Sherri's Shepherd and there is no other religion but Christianity. Amen. I hope, make that pray, for Sherri's sake, salvation, soul and all other manner of s words, that when she arrives at the pearly gates with the rest of the flock of sheep, she won't be made to answer a skill-testing question to get in. Like, on a scale of one to ten, what's your favourite colour? Otherwise she'll be catching that express roller coaster, Hellinahandbasket, at Mach 5 in a downward spiral, and lending an entirely new meaning to the term hot to trot. Sherri is in the handbasket. Did you read any of the over 1000 comments? Not only is she in a handbasket but she was burned at the stake. The #1 word used to describe her: "dumbass." This program is directed at women. Female viewers is the target demographic, right? And she's a recent addition to the show, from what I understand. I'm aware of her flat earth statements, so her intellect is not in question. It's simply imperceptible. I suspect this was well known before she was hired, or at least suspected. So exactly what do you think the producers of the show think about their target demographic? Little miss homemakers, with no brains? If I was a woman, I'd be insulted that they actually hired her for the show, and I'd boycott it.